This Article, prepared for a conference on the Class Action Fairness Act, examines the effect of CAFA on our understanding about the benefits and drawbacks of class actions. 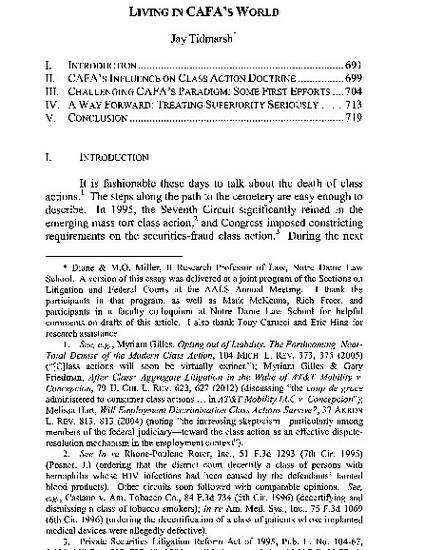 The Article describes the vision of class actions that imbues CAFA, and demonstrates how many subsequent developments in the law of class actions — including the Supreme Court’s decisions in Wal-Mart v. Dukes, AT&T Mobility v. Concepcion, and Shady Grove Orthopedics v. Allstate Insurance — have advanced CAFA’s restrictive vision about the role of class actions in modern American litigation. The Article demonstrates that competing visions about the role of class actions lack the broad reach or intuitive appeal of CAFA’s vision. It then suggests that, if the class action is to become a less disfavored procedural device, a more compelling competing vision for class actions must develop. It concludes by suggesting one such vision: class actions should be certified only when they are superior to all other forms for resolving disputes.